With two experimental deep space communications relay CubeSats riding along, the InSight spacecraft and the Atlas 5 rocket are scheduled for liftoff at 4:05 a.m. EDT (7:05 a.m. EDT; 1105 GMT) Saturday from Space Launch Complex 3-East at Vandenberg Air Force Base, California. InSight’s arrival at Mars is fixed on Monday, Nov. 26, 2018, when the robot will plunge into the Martian atmosphere, using a combination of a supersonic parachute and braking rockets to touch down with the aid of three shock-absorbing landing legs in Elysium Planitia, a broad equatorial plain with few boulders or craters that could pose a hazard during the spacecraft’s final descent. 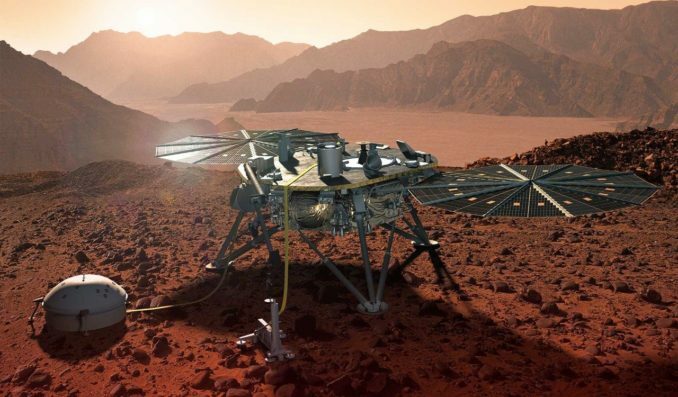 Once on the Martian surface, InSight will unfurl solar arrays and place two instruments on the ground using a robotic arm to listen for tremors and measure the heat flow coming from the planet’s super-heated interior. “The goal of InSight is nothing less than to better understand the birth of the Earth, the birth of the planet we live on, and we’re going to do that by going to Mars,” said Bruce Banerdt, InSight’s principal investigator from the Jet Propulsion Laboratory. Saturday’s predawn launch will be the first time a mission to another planet has left Earth from Vandenberg, the primary launch base on the West Coast. The 188-foot-tall (57-meter) Atlas 5 rocket, built by United Launch Alliance, will initially send the InSight spacecraft toward the south-southeast over the Pacific Ocean, with the booster stage’s kerosene-fueled RD-180 engine generating around 860,000 pounds of thrust. The Atlas 5’s Centaur upper stage will ignite its RL10 main engine, burning a mixture of hydrogen and oxygen, two times to place InSight into low Earth orbit, then hurl the science probe toward Mars. The Centaur upper stage will release the 1,530-pound (694-kilogram) InSight spacecraft, built by Lockheed Martin, around 93 minutes after liftoff. Two briefcase-sized interplanetary CubeSats, part of the Jet Propulsion Laboratory’s Mars Cube One technology demonstration mission, will spring out of carriers on the Centaur stage moments later to chart their own path toward the red planet. The twin Mars Cube One, or MarCO, nanospacecraft will become the first CubeSats to travel into interplanetary space, providing a radio relay capability to beam telemetry from InSight directly to Earth as the lander drops into the Martian atmosphere. But InSight does not need the MarCO CubeSats to make a safe landing. The entry, descent and landing maneuvers will be pre-programmed into InSight’s on-board computer for the make-or-break arrival at Mars in November. A blanket of fog forecast at the Vandenberg launch site early Saturday may inhibit viewing of the Atlas 5’s climb into space from nearby observation posts, but the reduced visibility is not likely to prevent liftoff, officials said Thursday. The Air Force levies a constraint for favorable visibility during an Atlas 5 launch to meet range safety requirements, but Air Force officials said they have workarounds to gather data on the rocket’s trajectory after liftoff with other tracking assets. The fog would only become a problem if the other range safety capabilities were offline. Ground crews at the SLC-3E launch pad, perched on a hillside overlooking the Pacific Ocean, will switch on the Atlas 5’s avionics late Friday for pre-flight checks, then retract the towering mobile gantry shortly before midnight, Pacific time, to reveal the rocket on its launch mount. The launch team will load cryogenic liquid oxygen and liquid hydrogen propellants into the two-stage Atlas 5 rocket during the final hours of the countdown. A final pre-planned hold in the countdown is scheduled at T-minus 4 minutes, giving managers time to complete final polls of the launch team before clocks resume at 4:01 a.m. PDT (7:01 a.m. EDT; 1101 GMT). InSight has launch opportunities available every five minutes during Saturday’s two-hour launch window. If technical or weather concerns prohibit liftoff Saturday, the mission has launch dates available through June 8, and still reach Mars on Nov. 26. NASA’s 20 previous Mars missions have all departed from Cape Canaveral, taking advantage of Earth’s rotation by launching toward the east. The extra momentum gives rockets an additional boost. But InSight is small, with a mass well below the lift capability of the United Launch Alliance Atlas 5 rocket, which will fly in its basic “401” configuration with a four-meter payload fairing and no solid rocket boosters. That means the Atlas 5 will not need the extra energy imparted during an eastward launch from Cape Canaveral, and ULA and NASA agreed to launch InSight from Vandenberg. The launch contractor proposed to base the mission from the West Coast because fewer Atlas 5 missions are scheduled from Vandenberg, so officials wanted to reduce the workload at ULA’s busier launch base in Florida. The final burn of the Centaur upper stage will give InSight enough speed to escape the bonds of Earth’s gravity, sending the spacecraft into the solar system on a trajectory mimicking the course the mission would have followed if launched from Florida. To complete the analogy, sidearm and overhand pitches can both deliver the baseball to a narrow strike zone 60 feet away. In InSight’s case, the Atlas 5 can deliver the lander to Mars from either coast. InSight will head for a broad plain near the Martian equator with ample sunlight year-round, providing enough warmth and solar power to keep the mission operating for nearly two years, or a little more than one Martian year. Assuming the mission takes off Saturday, InSight will embark on a 301-million mile (485-million-kilometer) journey. Several course-correction maneuvers are planned during the trip, setting up for InSight’s fiery descent through the Martian atmosphere. Employing a similar entry, descent and landing profile as the Phoenix mission a decade ago, InSight will approach the target landing zone in Elysium Planitia, with its heat shield absorbing blistering temperatures up to 2,700 degrees Fahrenheit, before unfurling a parachute and firing downward-facing rocket thrusters to settle to a gentle touchdown. 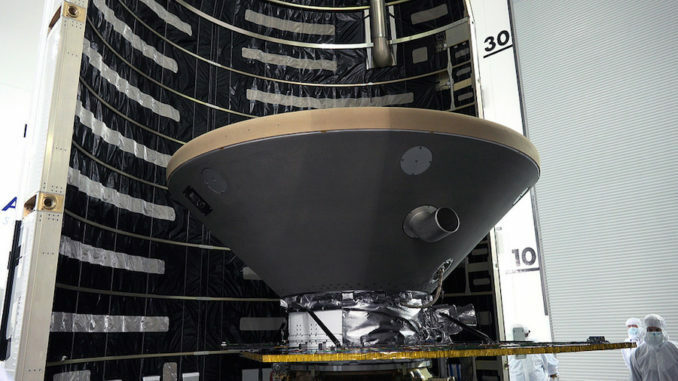 InSight was originally supposed to launch in March 2016, but problems sealing a vacuum enclosure containing one of the lander’s primary instruments, a French-developed seismometer, forced officials to postpone the mission. Mars launch opportunities come once every 26 months, when the planets are in the proper positions in the solar system, so the next chance to send InSight to the red planet opens Saturday. Engineers redesigned the vacuum enclosure to eliminate an air leak in a feed-through, or wiring interface, used route data between the seismic sensors inside the instrument and electronics and communications equipment aboard the InSight spacecraft. The protective enclosure keeps out wind and other environmental conditions that could disrupt the sensitive seismic measurements. It must keep a seal through the large temperature swings on Mars. “One of these feed-throughs was not capable of maintaining itself through the large temperature extremes,” Banerdt said. “When we actually tested at Mars conditions going down to minus 100 or minus 120 degrees Celsius (minus 148 to minus 184 degrees Fahrenheit). It developed a very tiny crack and started leaking — started allowing some air to come in. “This was enough to upset the whole apple cart in terms of the sensitivity of the seismometer,” Banerdt said. JPL took over responsibility for fabricating a new enclosure, while the French space agency, CNES, remained in charge of the instrument’s internal sensors. The seismometer is now healthy, their enclosure sealed, and are ready for launch. 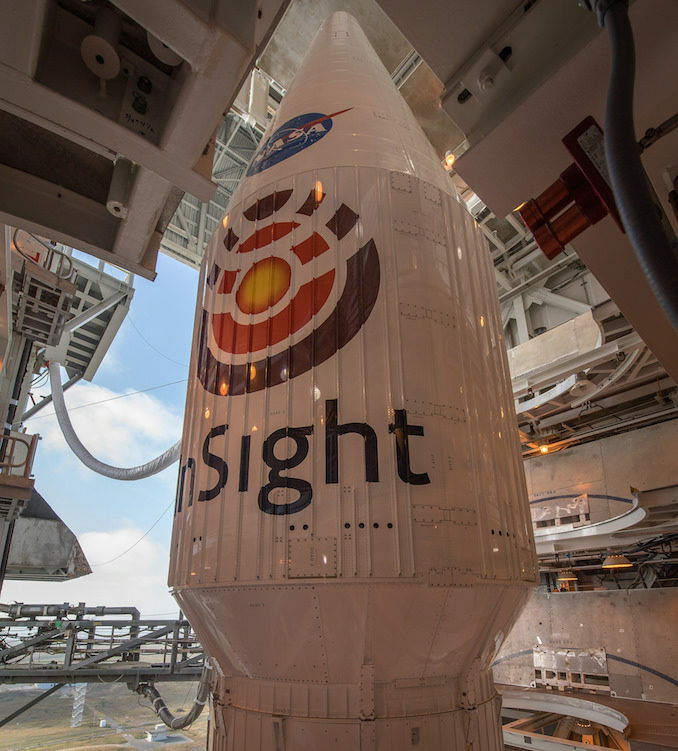 The InSight spacecraft itself, along with a German-built heat probe sensor and the United Launch Alliance Atlas 5 rocket, were all in position at Vandenberg for the March 2016 launch when NASA managers decided in December 2015 to keep the mission on the ground. The two-year delayed added roughly $150 million to InSight’s cost, which now sits at more than $993 million, including launch and operations expenses. That figure includes an investment valued at approximately $180 million from the French and German space agencies. The twin MarCO spacecraft cost another $18.5 million, according to NASA. 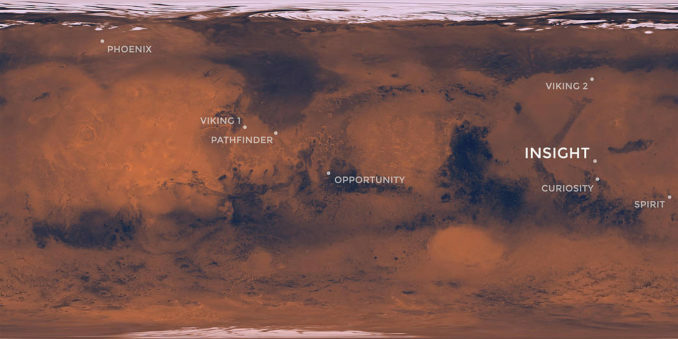 One of InSight’s first jobs will be to take panoramic pictures to survey the landing site, a region unexplored by past Mars missions. InSight carries cameras based on technology originally developed for the Opportunity and Curiosity rovers, but with added capability for color imagery. A nearly 8-foot-long (2.4-meter) robotic arm will place the seismometer and heat probe on the Martian surface next to the lander after touchdown. InSight’s robotic arm was originally built for the canceled Mars Surveyor lander that was supposed to launch in 2001. 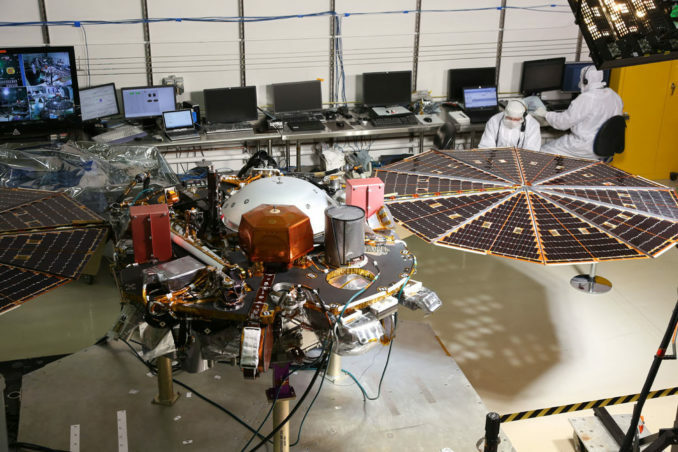 Other leftover parts on InSight include a landing radar originally built as a spare for the Phoenix mission, and surplus structural booms from the Curiosity rover repurposed for a Spanish-built weather station on InSight to collect temperature and wind data. Once placed on the surface of Mars, the German-made Heat Flow and Physical Properties Package, know as HP3, will hammer to a depth of 16 feet, or 5 meters, a process expected to take around six weeks with roughly 10,000 individual hammer blows, accounting for several planned pauses to allow the instrument to record thermal conductivity measurements. A metallic mole will probe deeper into the Martian crust than any past lander. The seismometer will get to work listening for marsquakes. “Sensitive is really an understatement,” Banerdt said of the seismometer. “Tt’s an exquisitely sensitive device for measuring the motion of the ground. And when we talk about motion, we’re talking about vibrations that have an amplitude comparable to the size of an atom. The seismic sensors aboard InSight evolved from mission concepts in the 1990s and 2000s that would have dispatched multiple small probes to Mars, creating a global geophysical network. InSight will be just one seismic station, but scientists have developed techniques to glean information about the interior of Mars, even with a single seismometer. An electrical and data cable will connect the seismometer to the InSight lander. “but we can measure that, and extrapolate it down. So if you have an astronaut on the planet, you can do this in maybe 20 minutes or half an hour. But if you want to do it robotically, you have to get a little bit more clever. “We have something we call a MOLE, because it’s something that burros down into the surface, and what it is is it’s a little torpedo with a hammer on the inside that gets wound up on a motor and about every three seconds, hammers this thing down and finally, it should go down five meters or so, which is about 15 or 16 feet, and it pulls behind itself a cable that has temperature sensors along the cable. So instead of only going down a few feet, we think this remote probe can actually go down about 15 feet, which gives us a better baseline to measure the temperature increase with depth and be able to estimate the amount of heat coming out of Mars. “And that amount of heat is tied to the geological activity of the planet. It’s the heat engine of the planet that drives vulcanism, it drives tectonic activity, it drives mountain building. 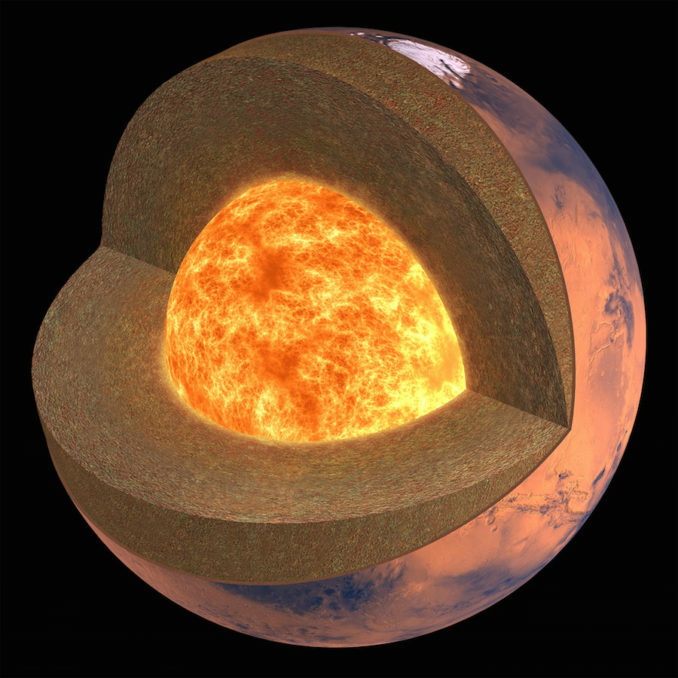 So all the geological processes that happen on a planet are driven by its heat engine, and we want to measure sort of the vigor of that heat engine.